Rich dark chocolate and espresso laced with salted caramel, topped with chocolate whipped cream. It is simply divine. Last year I shared my salted caramel fauxccino at The Nourishing Gourmet so it was only fitting that I also share the cool weather version that I have been enjoying for over a year with you as well. Most things I share here are quite nourishing. This delightful coffee is not one of them. It’s made with real food ingredients but it’s definitely a dessert saved for a special treat. Everyone one needs a special treat now and then right? Of course! 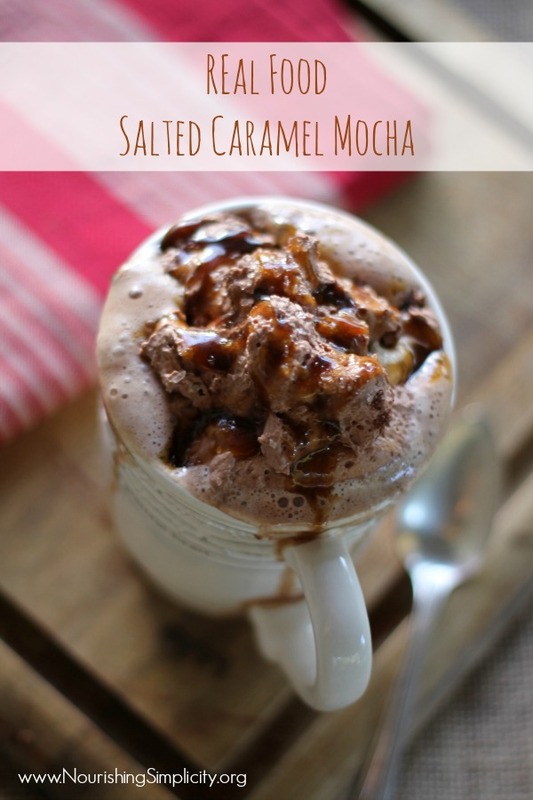 This rich mocha top with chocolate whipped cream, dark caramel sauce and a sprinkle of coarse real salt is divine! The salt slowly melts into the caramel and whipped cream, infusing the drink, balancing with sweet with just a touch of salt. Add the cocoa paste, 1 TBS caramel and coffee/espresso to the milk. Whisk until smooth. Top with chocolate whipping cream, the remaining caramel sauce and a pinch of salt. What is your favourite mocha? Do you make it at home? If you do please share it with us in the comments!